John Nerbonne (1951) has been professor of Alfa-informatica at the University of Groningen since 1993. Before that, he was active at Hewlett Packard laboratories in Palo Alto, and the German Research Center for Artificial Intelligence in Saarbrücken. 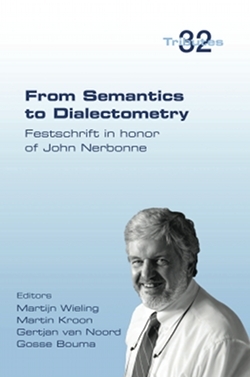 John Nerbonne made numerous contributions to formal and computational linguistics, including computational morphology, syntax and semantics, and was both founder and face of the Groningen School of Dialectometry. This volume inlcudes over forty scientific papers by a variety of distinguished scholars, colleagues, former colleagues and former PhD students to celebrate John Nerbonne's long, successful and productive career. The varied contributions in this book highlight the diversity of his research interests, as well as the important role he has played in shaping various research areas.